One clue as to how we feel while listening to music is in how we move, from dance-like motions to brows furrowed in concentration. Surface electromyography sensors (sEMG) are very useful in picking up muscle contractions which generate these expressive behaviours. In the solo response project, two typical sensors on the face to capture brow furrowing and smiling (see the set-up post) and an additional sensor tracking contractions of the trapezius muscle up the back of my neck, to capture tension in the back and head nodding. While there is much to say about each signal, this post is about what these sensors measured of my responses to Varuo, by Sigur Ros. 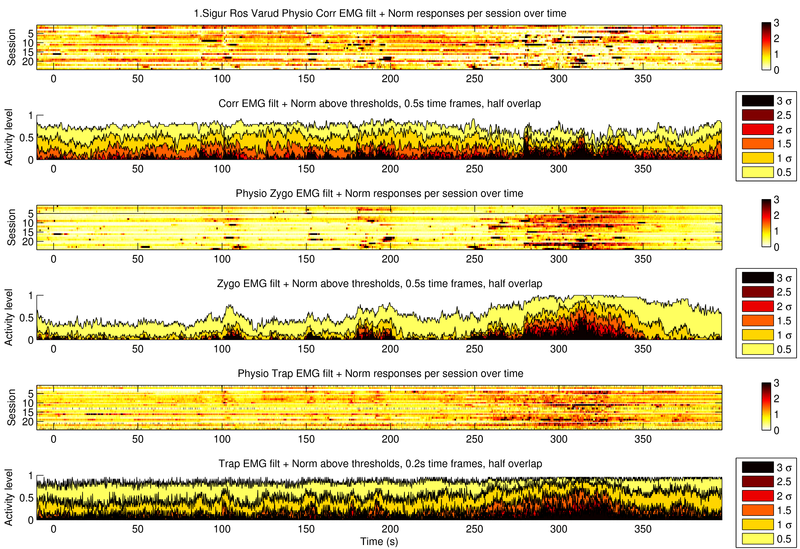 sEMG activity of the Corrugator Supercilious, Zygomaticus, and Trapezius through the 24 listenings of Sigor Ros’ Varuo. Session X Time heat plots and normalised activity-levels per signal. In the analysis post, I mentioned that the B section, starting around 220s, was really intense, and often overwhelming. These sensors agree with that, all shwing more instances of high muscle activity across sessions from 250s to 350s. Sublime face, yawning, and an explanation of how to read this graph below the cut.